Blooms Landcare has provided trustworthy landscaping service in Fort Worth, TX since 2006. It is our passion to assist our customers in creating an outdoor environment they can be excited about. Our Fort Worth landscapers use their experience and knowledge to produce a brilliant finished product that exceeds expectations. You can depend on us for all your land care services, including landscape design, landscape installation, commercial landscape maintenance, sprinkler systems, and even outdoor lighting. The myriad of services we provide can transform your outdoor environment into one you can be truly proud of. Call one of our experienced Fort Worth landscapers for assistance today. When it comes to landscaping knowledge, we truly take things to the next level. Our staff includes experienced arborists with degrees in horticulture. They have devoted their careers to creating beautiful, living works of art! We aim to provide a landscape that is lush, functional, and long-lasting. 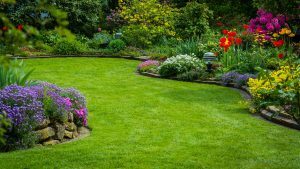 From the moment you give Blooms Landcare a call, we will get right to work in assessing your landscape needs and providing you with a free landscaping quote. You will be surprised at how reasonable our rates are for such superior service. Give us a call and see why people refer their friends and family to Blooms Landcare! What are the irrigation requirements for turfgrass and landscape plants? Under most circumstances, rainfall occurs at an irregular interval, so irrigation is required to assure that plants receive the hydration they need to thrive, even for shrubs and trees. The amount of water needed for turfgrass depends on the type of grass but can range from 20-35 inches. Call the professionals at Blooms Landcare to find out the best irrigation plan for your home. We know many of our clients get their green thumbs going in the springtime, but it may actually be best to plant new trees and shrubs in the fall. Especially with the volatile summer heat that North Texas faces, many new plants simply won’t thrive if they’re introduced during this time. If you have questions about specific plants or think your landscape provides unique circumstances, give us a call with further questions. The Dallas-Fort Worth Metroplex consists of 12 counties in North Texas. The entire area has a population of roughly 6.5 million, based on 2009 estimates. Fourteen cities in the metroplex have populations of more than 100,000. The area includes a high concentration of corporate headquarters, as well as some of the largest information technology and defense manufacturer companies in the world. For more information regarding our landscaping service in Fort Worth, contact Blooms Landcare at (817) 688-5352 to schedule your appointment.